I love this plant. I smile when I see it opening. I could tell you about the species but one can get that info easily enough. This plant is hardy; it survives in Ocean View, Hawaii, where the rain is slight, the winter temperature drops at night and the days are bright. We are at 2300 feet elevation; I know it grows nearer to the ocean where the young plant was raised. It seems delicate and lasts a long while. This person lives in the shade house as a sort of guardian and is never sold. The orange blossom scent equals the best orange trees. 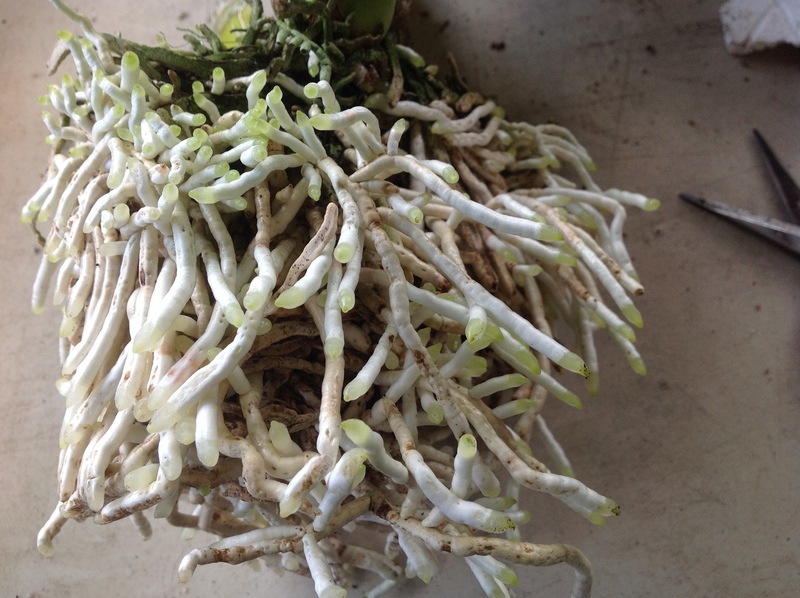 I find it an indicator plant for mealy bugs. They will go here first. I pay attention and look around for more. These popped out of nowhere. They do love being on lava. I forgot they were here. When I gazed at their faces I felt the slime that’s been floating around the ethers thin.